If you have a plugin that isn’t available on the dashboard but what you want to use for a study, or to simply share it with all of us, navigate to the Developer-tab on the AWARE dashboard. From there, click the ‘Add new’ button. Each plugin requires a name and the package (.apk) file. Please refrain from using the default package name (‘com.aware.plugin.template’) in your manifest (AndroidManifest.xml) as well as not using the default .apk filename (app-debug.apk). Doing this will make updating and using your plugin unreliable and will likely be denied completely in the future. You can also add an URL to the GitHub repository of the plugin if you wish to open-source it, an icon to represent the plugin when its published on the repository, as well as a broad description of what the plugin does. In addition to the required fields, it is also recommended that you fill in the settings, the broadcasts and the tables for your plugin. This helps other researchers and developers when they are using your plugin. Your plugin’s settings, their description and values are defined in your plugins Settings.java file. If you haven’t defined them there yet, please do before submitting your plugin. The status variable is required for all plugins (status_plugin_xxx). Otherwise you won’t be able to start your plugin. Set the corresponding name (String) for each setting and the possible values. Also include the broadcasts and the possible values your plugin sends across the Android OS in the ‘broadcasts’ section. Include any broadcast extras and their description as well. You can add new settings and broadcasts by clicking the ‘+’ button and new extras to broadcasts by clicking the ‘new Extra’ button on the corresponding row. Finally, also include the tables your plugin stores the data from your ContentProvider. 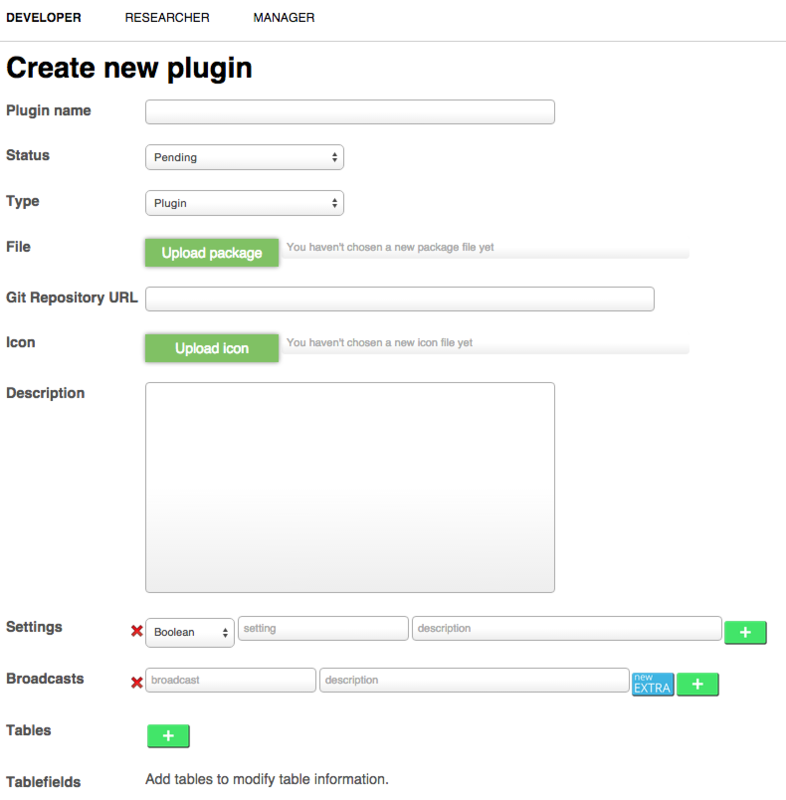 Your plugin can have multiple tables and you can add new by clicking the ‘+’ button. For each table field (i.e., table column) please specify the corresponding SQLite datatype. Finally, click ‘Save changes’ and your plugin will be uploaded into the dashboard. The permissions the plugin needs, the package name and the version are automatically extracted from the uploaded .apk file.